10 Genoani draw in San Siro: 1-1; grazie Perin! 7th in standing; also Hellas Verona victim! Three victories in a row, after Parma and Lazio this time Hellas Verona was our victim. Again Mattia Perin kept his clean sheet, while we scored by headers of Portanova and Kucka both after a cross of Matuzalem. The 2 goals were scored in the first half in front of Gradinata Nord. In the 2nd half Hellas tried to come back in the match but our defense, Mattia Perin and 1 time the post stopped Luca Toni c.s. to score. Genoa is now 7th in the standings with 17 points in 12 matches (4 points of Liverani and 13 of Gasperini, both in 6 games). Next weekend the play-offs for the World-cup next summer in Brasil take place which means that our next match is Saturday 23rd November at 20.45 hours in San Siro against A.C. Milan that has only 13 points. Just as the last 2 seasons Genoa has beaten Lazio in Stadio Olimpico in Rome. Mr. Gasperini started the match a little more defensive comparing to the match against Parma last Wednesday. He waited till the 2nd half to bring Fetfatzidis in the team as substitute of Marchese. The Messi of Greece immediately brought more power in our offensive part. In the 60th minute he again made a slalom in midfield which ended with a perfect cross to Kucka who opened the score with his leftleg. In the 71st minute Genoa got a penalty after Ciani stopped the cross of Antonelli with his arm. Alberto Gilardino walked towards the penaltyspot, the man who missed a penalty last Wednesday against Parma. Matuzalem was afraid to watch (see foto), but this time Gila scored: 0-2. 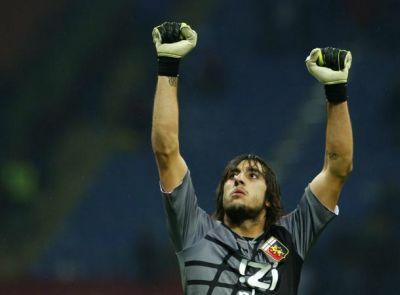 Of course Lazio tried to return in the match, but our defense was strong, just as keeper Mattia Perin. Genoa now is 8th in the standings with 14 points in 11 matches.